Troy Gentry, of country duo Montgomery Gentry, killed in helicopter crash. Troy Gentry, one half of country duo Montgomery Gentry, has died following a helicopter crash in New Jersey, according to a statement posted on the group's official site. He was 50. "Troy Gentry's family wishes to acknowledge all of the kind thoughts and prayers, and asks for privacy at this time," the statement read in part. The crash took place at about 1 p.m. ET in Medford, according to the statement. Montgomery Gentry was scheduled to perform Friday night at the Flying W Airport & Resort in Medford. Details of the crash are not yet known. Montgomery Gentry formed in 1999 and produced a number of country music hits, including "My Town," and "Hell Yeah." Recording artists Sheryl Crow, Josh Turner and Brad Paisley were among those who paid tribute to Gentry on social media following news of his death. Montgomery Gentry have multiple Academy of Country Music and Country Music Association awards nominations to their name. They were inducted into the Kentucky Music Hall of Fame in April 2015, according to their website. 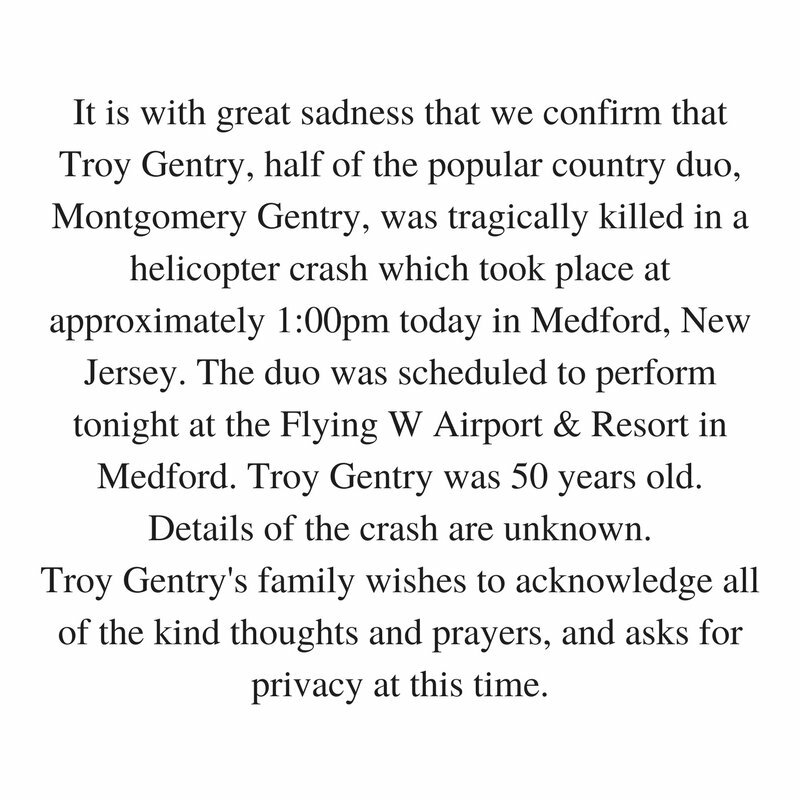 Re: Troy Gentry, of country duo Montgomery Gentry, killed in helicopter crash. Was it an accident, or did the bears finally get their revenge? Saw them at the Grand Ole Opry last year. They were decent I guess. Troy was the good looking one, not the goofy one with the hat.